During the summer months it’s often hard to keep your little ones out of the water. Splashing around in the pool or ocean is not only a great way to stay cool, it’s FUN! And now there’s a way to have even more fun–with a mermaid tail from The 2 Tails. 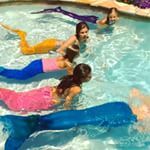 The Burbank-based company was started by twin girls with a love for the water and mermaids. Now, they offer tails for all ages and sizes… even for Mer-men and boys! To learn more, be sure to click on our video below!